You are loo­king for a trans­la­tor who trans­fers your text com­pet­ent­ly into ano­t­her lan­guage? 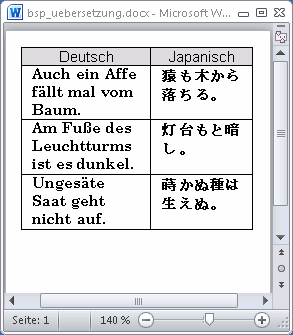 I have spe­cia­li­zed mys­elf in trans­la­ti­ons for the Ger­man — Japa­ne­se lan­guage pair. Trans­la­ti­ons are per­for­med by eit­her using a soft­ware cal­led Ome­gaT or for docu­ments with a low wor­d­count stan­dard text pro­grams such as Micro­soft Office or Open­Of­fice. When using stan­dard text pro­grams for trans­la­ti­on tasks the text is edi­ted wit­hin the ori­gi­nal file, its con­tents are trans­la­ted into the tar­get lan­guage and then saved as a new file. If the text to be trans­la­ted is pre­sen­ted in the form of pre-for­­ma­t­­ted con­tent, for examp­le in tabu­lar form, the trans­la­ti­on is ent­e­red in cor­re­spon­ding table fields as shown in the adja­cent figu­re. My trans­la­ti­ons enab­le you to tra­de suc­cess­ful­ly, attract new custo­mers and let you rea­li­ze your full mar­ke­ting poten­ti­al. The focus of my trans­la­ti­ons are the are­as of cor­re­spon­dence, brochu­res, adver­ti­sing texts, web­sites, cata­logs, tech­ni­cal texts, manu­als and pre­sen­ta­ti­on docu­ments. As a japa­ne­se nati­ve speaker who grew up in Japan and has lived the­re for 38 years I can take into account the subt­le­ties and idio­syn­cra­sies of the trans­la­ti­on of japa­ne­se wri­ting, lan­guage and cul­tu­re very well. All trans­la­ti­ons are done by mys­elf as an expe­ri­en­ced, pro­fes­sio­nal trans­la­tor. In my trans­la­ti­ons I attach gre­at impor­t­an­ce to the fact that the trans­la­ti­on has a high lin­gu­is­tic qua­li­ty. A trans­la­ti­on should read as if it is no trans­la­ti­on at all. This is achie­ved through a mul­­ti-step opti­mi­za­ti­on pro­cess for the tar­get text to get the best trans­la­ti­on results. 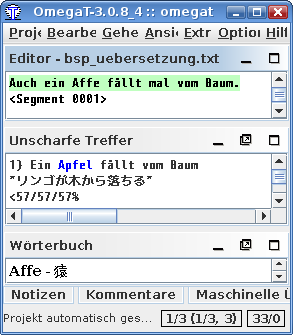 For trans­la­ti­ons of lar­ge texts in which the con­sis­ten­cy of terms is important as well as for new text ver­si­ons the com­pu­ter aided trans­la­ti­on soft­ware Ome­gaT is used. Trans­la­ti­ons for iden­ti­cal sen­ten­ces are adop­ted by Ome­gaT while sen­ten­ces which have chan­ged in new ver­si­ons of the docu­ment are dis­play­ed to the trans­la­tor. Ome­gaT divi­des text into seg­ments and dis­plays them to the trans­la­tor for edi­t­ing. Trans­la­ted seg­ments are auto­ma­ti­cal­ly stored in a trans­la­ti­on memo­ry file. For the con­sis­ten­cy of trans­la­ti­ons a ter­mi­no­lo­gy manage­ment is extre­me­ly important. Ome­gaT uses the above trans­la­ti­on memo­ry file as well as dic­tio­n­a­ries and glossa­ries con­tai­ning trans­la­ti­ons of indi­vi­du­al terms. To cal­cu­la­te the cost of trans­la­ti­ons the word count of the text is used. The num­ber of words wit­hin a text is deter­mi­ned with the soft­ware Ome­gaT and then mul­ti­plied by the word pri­ce of 0.08 Euro for trans­la­ti­ons which as a result pro­vi­des the pri­ce for the trans­la­ti­on of the text. Ome­gaT reco­gni­zes repe­ti­ti­ons of iden­ti­cal seg­ments such as sen­ten­ces, hea­dings or lists. The­se repe­ti­ti­ons are offe­red for trans­la­ti­ons at a pri­ce of 0.02 Euro per word. Detail­ed infor­ma­ti­on can be found at the Order menu. A cer­ti­fied trans­la­ti­on docu­ment can only be made by a sworn trans­la­tor. I am not publicly appoin­ted and not sworn by a government district court. The­re­fo­re I can not pro­du­ce cer­ti­fied trans­la­ti­ons of docu­ments for aut­ho­ri­ties or courts.